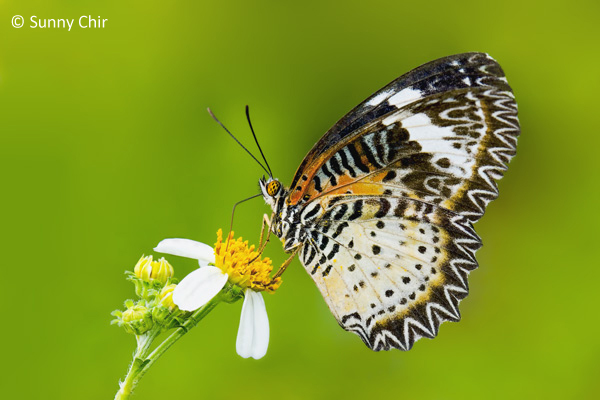 A female Leopard Lacewing visiting the flower of Bidens alba. A female Leopard Lacewing showing its uppersidevisiting Lantana flowers. 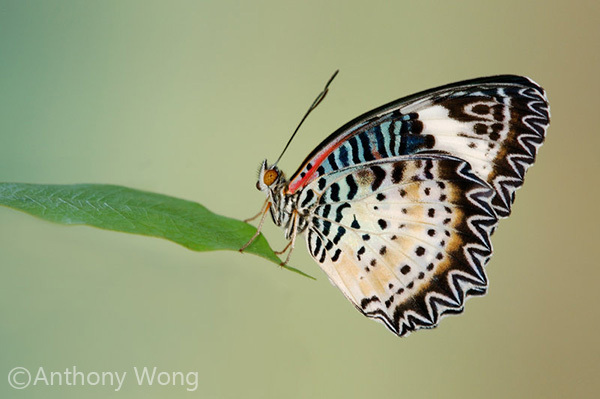 Above, the male is orange with apical two-thirds of the forewing black with a white and oblique band lying within. The termen of both forewing and hindwing is indented and lined with a broad and black marginal area containing a lace-like pattern of white markings. 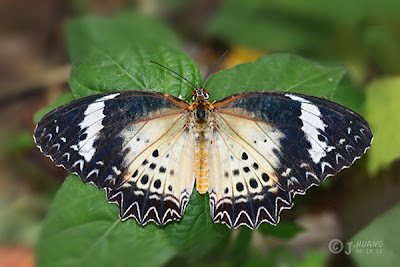 The female is mostly similar but with the orange background replaced with a pale yellowish to whitish coloration, and has its hindwing endowed with more discal and postdiscal black spots. Underneath, the wings are variegated with orange, red, white, black and blue. In the forewing, the cell area is transversed with bars of black, bluish-white and red coloration, beyond which a broad, white and oblique band lies just below the subapical area. 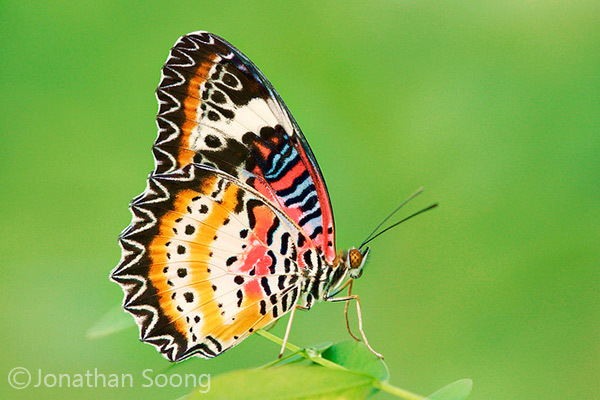 In the hindwing, the ground colour is orange in the male and pale creamy yellow in the female. The basal area and the costal margin are crossed by short black lines, with the ground colour more reddish in the male. A somewhat broad discal band and a narrow post-discal band, both white, are bordered with black spots and striae. As in the upperside, the terminal margins are black and house lace-like white markings, with additional short white straie pointing from the margin inwards to the tip of the V-shaped markings.